This new spiral-bound edition combines our HIV/AIDS and Hepatitis guidelines into a single publication for increased ease of use. 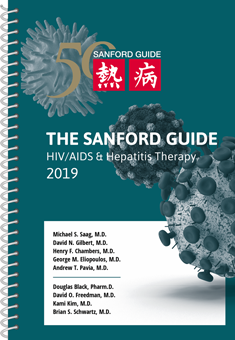 Providing in-depth guidance in the use of the latest agents and treatments, the Sanford Guide to HIV/AIDS & Hepatitis Therapy is a valuable supplement to our Guide to Antimicrobial Therapy. Antimicrobial Therapy 2019 (Spiral Edition 5" x 8") – Spiral-bound edition of our latest Guide to Antimicrobial Therapy.